The February 19 Sunday UAAP Women’s Volleyball matches didn’t involve any of the two teams at the bottom of the standings (University of the East and Adamson University) making for competitive matches. Or were they? Here are four things we can glean from the matches that saw the University of the Philippines win their fourth match against underachieving 1-3 University of Santo Tomas in four sets (25-22, 25-22, 29-31, 25-19) and the La Salle Lady Spikers crush previously undefeated National University in three relatively easy sets (29-27, 25-16, 25-21). UP has jumped from a contender to a bonafide favorite to win it all. The sole remaining undefeated squad in the tournament. They have lost only one set all tournament long and are getting better with every match. Theirs is a fortuitous schedule. They played two easy matches against Adamson and UE that was good in getting the early wins and their confidence then they took down defending champion La Salle in three sets before sending UST to its third loss in four matches. Coach Jerry Yee has gone with a small rotation but has begun to introduce more players into the mix and take note – not at garbage time but even at crucial moments. Case in point – former starting setter Mae Basarte and Aiesha Gannaban especially the latter who scored seven big points in her four-set stint on the floor. 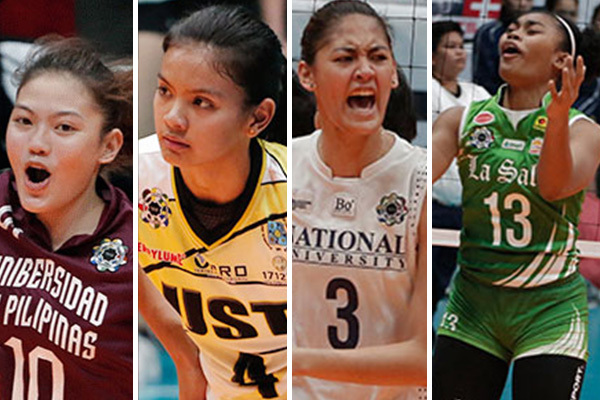 They have three other contenders to go through in succession – Ateneo, FEU, and lastly, NU. UST has to more than regroup if they want to stay in the hunt. On the strength of their showing in the last V-League, people, yours truly included, raved about them. How much more if they were complete, observers postulated. At that time, Tin Francisco and Carla Sandoval played major minutes for the UST Golden Tigresses. They played with so much confidence and exuded a freshness and a sense of fun (quite a contrast from UP that looked tired). Once the UAAP started, they were on the bench (and UP looks good now). At this point, maybe Kungfu Reyes should try playing the two more. After all, the regulars haven’t done very well for themselves. There’s talent and depth here. Then as in now, I said that what would keep them from going forward and deep into the season (Final Four) is their mental strength. These four games showed that it isn’t there. Bumibitaw in the vernacular. Kungfu has wondered about leadership. We hear that during the huddle. I agree but that’s also mental strength. They somewhat get a reprieve when they play Adamson next followed by NU and FEU. They need to win all those games or by the time the first round is done, the season could be all over for them. Don’t cross out La Salle by any shot just yet. How do you come back from a terrible loss? How about taking down a contender to your crown and in three sets no less? You have to give a lot of credit to the coaching staff and the Lady Spikers for not showing any effects from the previous loss to UP. They looked to get buried under by NU in the first set but showed tenacity and resiliency. Once they took the first set, they were more relaxed. You can see some players finally putting it together from middle hitter Aduke Ogunsanya and opposite hitter Tin Tiamzon. And the Michelle Cobb cameo was pretty good. An early season loss can be good or bad. If one learns from it, then it is a reminder that a lot of work needs to be done. And they sure worked on NU that couldn’t get into a rhythm. When this team gets rolling they will be even more frightening. More on that in the next. I thought that NU looked intimidated. Bad game? Maybe. Everyone has bad days. But they didn’t get up for this game especially with La Salle supposedly on thin ice after their previous loss to UP? This was a good chance to knock the Lady Spikers for a loop and stay in step with UP. But no. In my opinion, the Lady Bulldogs looked scared of La Salle. They sure did. That’s because of DLSU’s championship pedigree. Kim Dy and Desiree Cheng danced. Who wouldn’t have gotten pissed at this brash display of celebration? And well, did the Lady Bulldogs respond? No. They fell flat on their faces. Whether setter Jasmine Nabor wasn’t 100% but this team collectively flopped in a huge game. Some pundits opined that during their shaky performance against UE on Opening Day, and looking rocky late in the game against Ateneo, that NU doesn’t have the steel verve that will bag them a UAAP championship. That theory just gained momentum. Next for NU is FEU on Saturday, February 25.